It is a universally acknowledged fact that there is a discernible overt or covert ‘difference’ between the writing of men and that of women. Initially, after women became literate and thereafter educated, they began writing about their own lives as lived histories, recording the micro-politics of daily living in their memoirs, diaries and letters. That women would opt for life-writing or autobiographies as the preferred literary genre to any other was inevitable according to Virginia Woolf, as women’s lives were ones of confinement within the domestic. Basic education and very little opportunity to travel made women writers concentrate on domestic politics, which emerged as the central discourse in their literary writing. But late nineteenth century onward, women were exposed to both critical and creative reading material and in some degree to the public domain, which enriched and liberated their minds. So Woolf commented that women were eventually able to write as creative artists rather than diarists, and that ‘reading and criticism may have given her a wider range, a greater subtlety. The impulse towards autobiography may be spent. She may be beginning to use writing as an art, not as a method of self-expression’ (Woolf 86). This apparently disparate selection of women life-writers, spanning a period of over four hundred years, breaks free from the clichéd stereotype of mostly nineteenth and early twentieth century urban, middle-class women as first generation learners, who recorded their life experiences in memoirs, diaries, letters and autobiographies. The striking exception in this volume is the inclusion of novels and verse as autobiographical tracts. The editors argue that women’s writing grew out of lived experience and they used writing as a medium of self-expression, catharsis and confession. Therefore, breaking free from the western strait- jacketed traditional definition of autobiography, South Asian women’s narratives critiqued in this volume deconstruct the known contours of autobiographical writing, through the robust inclusion of mixed-genre life writing, from poems, songs and letters to diaries, memoirs and novels. In the first essay, Sylvia Vatuk describes at length her research and interest in the fictional writings and memoir of Zakira Begam, and how Begam’s perusal of Urdu literature inspired her to educate herself. Moreover, storytelling by her own family members, a performative act, nurtured a desire in her to read, write and publish. Zakira Begam received a PhD degree in Urdu in 1994 from the University of Madras. If Zakira Begam was a woman of ‘privilege’, so was Nayantara Sahgal. Sahgal’s novels are critiqued by Ritu Menon as representations of macro issues of national politics and the micro issues of a gendered existence within the Indian family, as a daughter and wife. Gender politics at both the macro and micro levels, both in public domain and personal life are analysed with incisive insight by Sahgal in her fiction. Critically informed essays on Nazr Sajjad Hyder and Kailashbasini Debi’s life writings also reveal their search for self and identity in a conservative patriarchal environment, the conservatism being significantly common to both affluent Muslim and Hindu families of the colonial times. The British litterateur Bernard Shaw had categorically remarked that all autobiographies are lies. In terms of authenticity, autobiographies may be read as subjective life histories but not as documents or testimonies. The subjectivity of the individual is the mediator that leads to the process of selection, rejection, romantic constructions and transgressions that can often challenge the veracity of the autobiographical text as a reliable document recording ‘unofficial histories’. 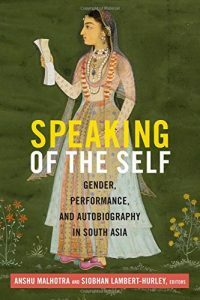 The subjective gendered life histories in these texts can be regarded as unofficial micro histories of the lives of women within their homes and their lives in the public spaces. In the second part of the volume, the most striking essay is the one on Jahanara Begum, the daughter of the Mughal Emperor Shah Jahan. The well-researched scholarly essay by Afshan Bokhari critiques the complex intertextuality of Jahanara’s treatise Sahibiyah that combines the imperial Mughal codes of administration, Sufi mysticism, spiritual interventions and the immediacy of the first person narrative. The two other essays in this section are a close reading of novels about the Partition written by Pakistani women writers, and the memoir of a courtesan, ‘Tawaif as Poet and Patron’ which may be read as either an act of subversion or a path-breaking step forward. Once again autobiographical and biographical elements are blended, extending to fictional narratives and poetic compositions, in order to inscribe the texts with life narratives of the women who desired to explore their identity through creative expression. The use of the camouflaged self that other literary genres such as fictional narratives and poems enabled, apparently granted more space to women writers to freely inscribe their responses, resilience and resistance. The third part of the volume includes a detailed analysis of the self-confessed prostitute Piro’s 160 Kafis, which are an amalgam of Punjabi verses that record the tensions between people belonging to different religious belief-systems of the Hindus, Sikhs and Muslims, and their religious practices. Piro made brilliant use of reinterpreting Hindu epics, Bhakti songs and compared the unfortunate life of Sita with her own. This is, indeed, a subject that can lead to further research on intertextuality and influences of grand narratives on the writing of women who were rooted in the periphery, as they were trapped within the intersections of gender, class, caste and religion. Raihana Tyabji’s The Heart of a Gopi is a complex spiritualized narration akin to the Bhakti versification rather than a prose memoir. Once again, we find that the influence of myths, saga and epics had a transforming effect on women, even on a Muslim woman like Raihana, who was a dedicated disciple of Mahatma Gandhi. The final essay in this volume, of autobiographical writing that deconstructs the monolithic genre and ushers in a sense of genre fluidity, moves away from life narratives by women to life narratives of Parsi stage actors who also impersonated women in some of the plays. This deconstructive re-reading of autobiography and the autobiographical will be of immense interest to researchers of cultural studies, gender studies and literature studies. Sanjukta Dasgupta, Professor, Department of English (Retd) and Former Dean, Faculty of Arts, Calcutta University, Kolkata, is Visiting Professor, Jagiellonian University, Krakow, Poland, and Convenor, English Advisory Board, Sahitya Akademi, New Delhi.